Turbinado sugar is a light-colored sweetener that is only minimally processed so that it retains some of the molasses that is naturally present in sugar cane. The word "turbinado" is a Spanish-American derivative of the word turbine—a machine used to process sugar. This blond sugar goes by several different names including "sugar in the raw," "demerara sugar," or "raw cane sugar." Turbinado sugar crystals are larger than other brown sugar or white refined sugar crystals. Turbinado sugar may offer health benefits to certain people depending on their dietary preferences, but since it is still sugar, it should be consumed in moderation. All of the calories in turbinado sugar come from carbohydrate. There are 18 calories in a single serving of the sweetener. A single serving is considered to be one level teaspoon. If you consume a commercial packet of sugar in the raw, it is likely to contain a single serving. All of the calories in a serving of turbinado sugar are sugars. That is, there is no fiber or starch in turbinado sugar. The glycemic load of turbinado sugar is estimated to be 3 when you consume a single serving. However, remember that glycemic load takes serving size into account. So if you consume more than a teaspoon, the estimated glycemic load will increase. There is no fat in turbinado sugar. However, this product is often used to flavor fatty foods, such as baked goods and other desserts. Turbinado sugar provides no protein. When consumed in typical amounts, turbinado sugar provides no significant micronutrients. However, consumed in larger amounts, the sugar may provide some minerals, according to USDA data. One cup of this sugar provides a small amount of iron, calcium, magnesium, phosphorus, sodium, potassium, and zinc. Turbinado sugar is often praised as a healthier alternative to refined white sugar. There are a few reasons that this claim may have some merit. First, the crystals of this sugar are larger. For that reason, you may consume slightly less of it when you spoon it into your morning coffee, berries, or cereal. 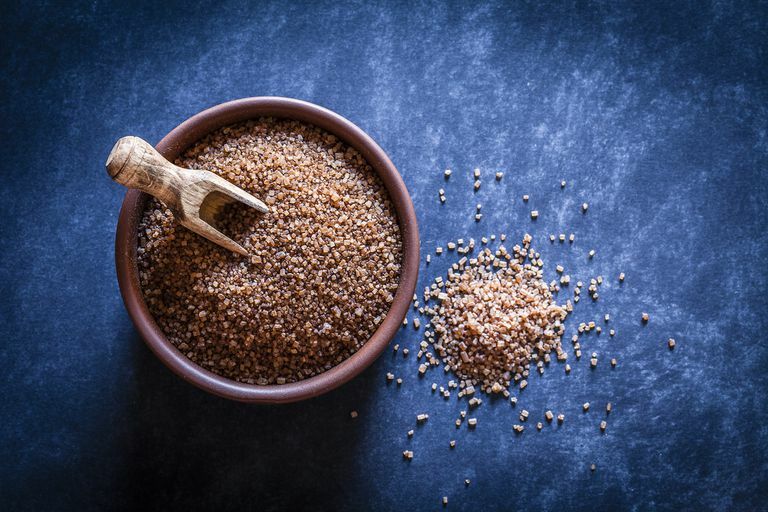 This sugar also retains some of the natural molasses flavors which might be more satisfying for some consumers—and may help them to consume less. Lastly, it is possible that raw sugar may provide more antioxidants than other types of sugar. Antioxidants are substances (often naturally found in foods) that may help prevent or delay cell damage. A study published in the Journal of the American Dietetic Association found that raw cane sugar was higher in antioxidants than refined sugar, corn syrup, and agave nectar. Turbinado sugar may also provide benefits to those following a vegan or vegetarian diet. This sweetener is not exposed to bone char—a product used to refine sugar. So those following a plant-based diet may prefer to use this sweetener over white table sugar or other sweeteners. Keep in mind, however, that any health benefit of turbinado sugar—or any sugar—must be weighed with the drawbacks of consuming sugar in the first place. Most of us consume too much sugar, often without knowing it. Sugar is found in sweet treats and is also often found in foods that you might not expect, such as spaghetti sauce, salad dressings, and other savory foods. Overconsumption of sugar and sugar-sweetened products may lead to weight gain, dental problems, obesity, and other conditions including type 2 diabetes. The U.S. Food and Drug Administration (FDA) recently made changes to the Nutrition Facts label that will help all consumers identify sugar and added sugar in the food that they buy. The new label will contain a line item for both "Sugars" and "Added Sugars" so that you know if sugar is added to the foods you buy. These improvements should be in effect for all food manufacturers by January 1, 2021. In the meantime, you can also check the ingredients label on your packaged foods to look for added sugar. Where can I buy turbinado sugar? Most grocery stores carry turbinado sugar in the baking aisle. When you are dining out, look for brown packets that contain sugar in the raw. How do I know if I am consuming too much sugar? Sugar is found naturally in many different types of food—such as dairy products and fresh fruit. For that reason, there is no recommendation for the total amount of sugar to consume each day. However, the Dietary Guidelines for Americans recommends that you consume less than 10 percent of your calories per day from added sugars. Keep in mind that many foods that are high in added sugar provide very little nutritional value in the form of fiber, vitamins, or minerals. These foods also tend to be higher in calories. However, you may notice a taste or texture change when you use raw sugar for baking. Some cooking experts note that the slight molasses-like flavor carries over into baked goods. Cooks also note that some baked goods such as cakes that have higher moisture doughs tend to be lighter and fluffier with raw sugar. But in recipes for muffins and other lower moisture doughs, raw sugar does not fare as well. You can also use raw sugar outside the kitchen. The large crystals and the sweet scent of raw sugar make it a preferred ingredient in body and lip scrubs. To make your own at home, simply combine the sugar with coconut, almond, or olive oil. Persons with diabetes should exercise care when consuming foods with turbinado sugar. Even though it is natural sugar, it has the same impact on your blood sugar as refined sugar. Sugar allergies and sugar intolerance are also possible. Symptoms may include mild digestive discomfort, gas, headaches, or more severe side effects such as fainting. If you suspect a sugar allergy or intolerance, speak with your healthcare provider for personalized advice. Sugars. U.S. Food and Drug Administration. Nutrition Education. Fact Sheet. Sweet Stuff. How Sugars and Sweeteners Affect Your Health. National Institutes of Health. News in Health. October 2014.